Ayleid Wells fortify Magicka by 50 points for five minutes and restore 400 points of Magicka once a day. Each one can be re-used after it recharges at midnight. There are thirty-five Ayleid wells in Cyrodill (map), and they are found near the Red Ring Road with great frequency and seem to be more commonplace in Nibenay than Colovia. They are sometimes found in conjunction with an Ayleid ruin. Built by the Ayleids from meteoric iron and other Aetherial fragments sometime before the end of the First Era, much of their presence remains a mystery. Irlav Jarol, Ayleid researcher and member of the Arcane University, has written a book called Magic from the Sky describing the creation of Ayleid Wells and speculating on the inner workings of the construction. Northeast of Tidewater Cave, southwest of Fort Blueblood (map). West of Onyx Caverns, east of Veyond (map). East of Niryastare, west of Fort Hastrel (map). North of Sandstone Cavern, south of Fort Linchal (map). Northwest of Fallen Rock Cave, east of Talwinque (map). West of Fort Linchal, north of Kvatch (map). Northeast of Goblin Jim's Cave (map). South of Fort Virtue (map). Southwest of Bruma, northwest of Bleaker's Way, on the Orange Road (map). Southwest of Fort Empire and due west of the Imperial City, on a path leading west away from the Red Ring Road (map). West of Nenyond Twyll, southwest of Fort Roebeck (map). At the junction between the Red Ring Road and the Yellow Road (map). Between Sercen and The Roxey Inn (map). Immediately northeast of Wellspring Cave and Fort Magia, due east of the Imperial City (map). Slightly west of Belda (map). South of Azura's Shrine, west of Lord Rugdumph's Estate (map). Halfway between Fort Aurus and Mackamentain (map). Northeast of Cracked Wood Cave, south of Nornal (map). Northwest of Hero Hill, east-southeast of Cheydinhal (map). West of Boethia's Shrine, east of Drakelowe (map). Northwest of Fort Gold-Throat (map). Just to the southeast of Fanacas (map). Due west of Skingrad and slightly southwest of Cursed Mine (map). East of Derelict Mine and Skingrad on the Gold Road (map). West of Wenyandawik, east of Fort Black Boot (map). The Fortify Magicka effect from the Ayleid Well does not stack, and as such activating multiple Ayleid Wells in short duration does not grant multiple Fortify Magicka bonuses. The effect is capped at 50. 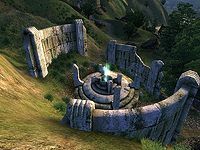 When using an Ayleid Well, the game acts as if you cast the Fortify Magicka spell, meaning that it contributes to your Restoration experience and that the magnitude of the magicka bonus is affected by your Spell Effectiveness. For this reason, it is best to remove all armor you're wearing just before activating the well to get the most Magicka (at 95% Spell Effectiveness you will receive 47 Magicka). Sometimes wells will not recharge at the correct time, but will begin displaying green sparkles again as though it were working correctly. Trying to use the well, however, will display the message "A drained well recharges slowly." ? This page was last modified on 3 October 2015, at 14:49.